Those looking to read faster will find an endless supply of tips and methods around the web. Beeline Reader is a service taking a unique approach—using color to guide your eye. The way Beeline promises to speed you through a long piece of text is by altering the color of each bit of text you encounter. 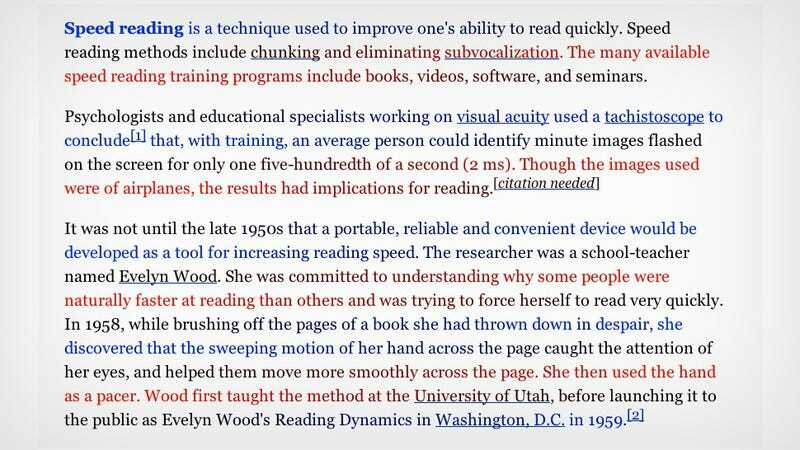 What this does is help your eye anticipate the next line of text with more clarity, giving you an almost imperceptible head start when moving down the page. You can install the Chrome extension and convert any longform article into the Beeline format, or you can paste a block of text right into the Beeline website. It certainly is an odd experience staring at the rainbow-smeared text, though it's easy to see how the advertised effect could ring true.